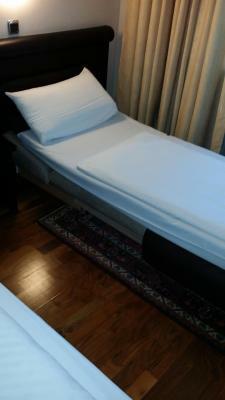 Good location..comfy bed...coffee maker ..but it will be perfect if provide tea.as well. 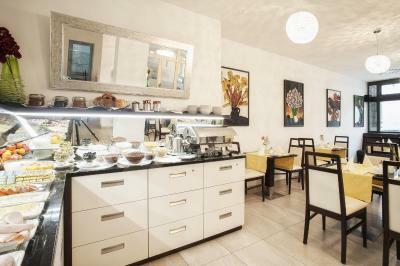 The staff was very helpful, location was only a few minutes from the subway station, breakfast was superb, room was very clean, elegant and modern. Will stay here every time I stay in Munich from now on. Rooms are very quiet & calm. Walking distance from public transportation station. Good value for money. Rigth next to the metro! Street parking close by. Room good and clean. 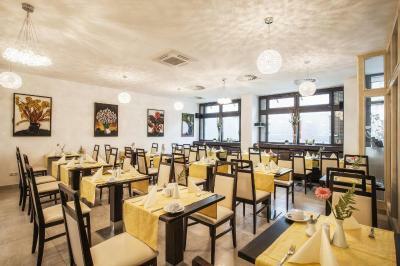 very helpful staff, very clean hotel, very comfort, very close to subway. all in one. definetely will come later. 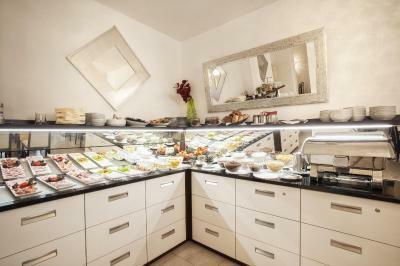 Located near the metro, with lovely staff and great breakfast. It was clean and the bathroom was nice also. I liked a breakfast - it was quite good. There were several types of: cheese, bread, jams, butter, sausages, eggs (fried & boiled), dairy products, sweets (cakes) and so on. Also hey had a good coffee. Location was more or less comfortable - bus station in front of the hotel (not with a large choice of routes though) and a metro station "Haras" in 2 minutes walk (as I remember, only 2 lines of metro were there, but anyway it was an extra option for transportation). Supermarket LIDL and shop DM were in 5-7 minutes walking distance. There was a small bakery/cafe near them as well. You can buy some drinks at a hotel, in the reception. Otherwise, if it is already evening, everything is closed around and you can only go to the MacDonald's, which is on 10-15 minutes walking distance. Elevator also was very comfortable facility - not all hotels have it. The room was clean and bed was surprisin good. Worth staying for couple nights and good as a budget hotel can be. Didn't have breakfast at the hotel. Room was clean and big enough. Breakfast very tasty with wide choce of food. 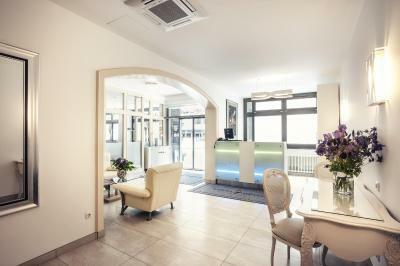 Hotel Rivoli This rating is a reflection of how the property compares to the industry standard when it comes to price, facilities and services available. It's based on a self-evaluation by the property. Use this rating to help choose your stay! 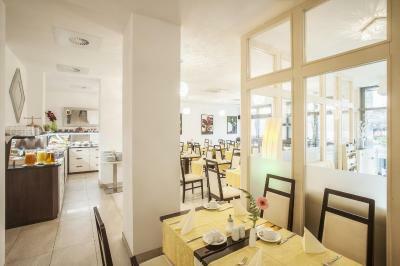 Just 350 feet from Harras Train Station, Hotel Rivoli offers stylish rooms with dark wooden floors, and daily breakfast buffets. It is just 4 train stops from Munich Central Station. 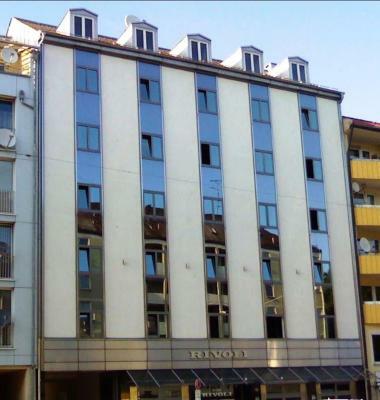 The rooms of the Hotel Rivoli include a flat-screen cable TV and a mini-bar. 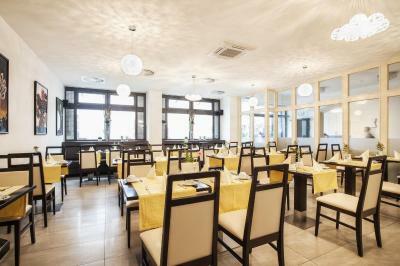 The hotel also offers apartments with living areas and fully equipped kitchenettes. 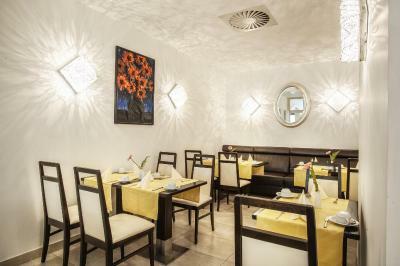 Rivoli enjoys a peaceful location in the Sendling district, beside a Turkish-style spa. Marienplatz Square in the city center is just 5 underground stops away. 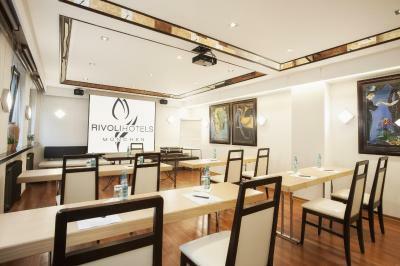 When would you like to stay at Hotel Rivoli? 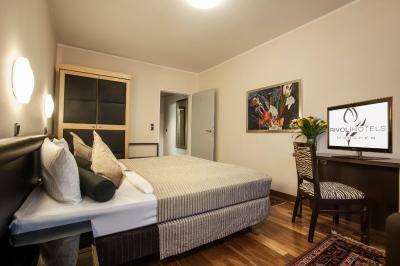 Modern room with free Wi-Fi internet access. 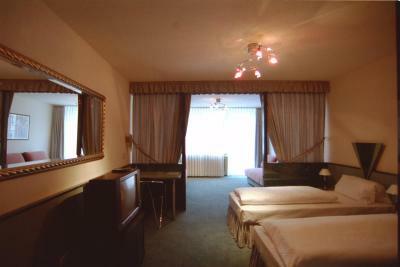 Stylish room with cable TV and a private bathroom. Please note that there's no capacity for an extra bed in this room. 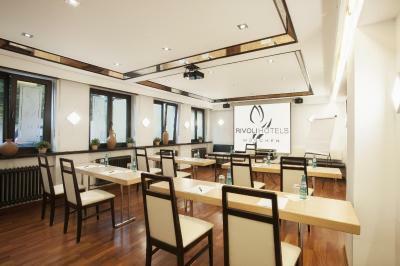 House Rules Hotel Rivoli takes special requests – add in the next step! Hotel Rivoli accepts these cards and reserves the right to temporarily hold an amount prior to arrival. Quite expensive for the last minute book. Could not sleep well on the single bed - no extra pillows were provided. First of all, we booked a double room with two separate single rooms, but when we entered the room, we found out that we got a twin room, with one bad. 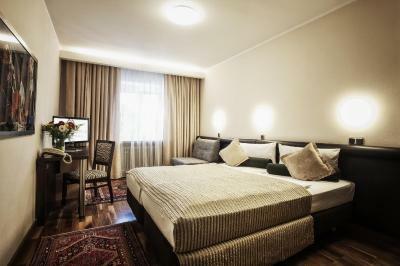 It was very unexpected and surprising, because during booking process I choose "two single beds" option. The guy at reception answered,, that the hotel just indicates on Booking.com options - twin or double room but if a guest requests one of them, it is not an order, but just a wish (?) 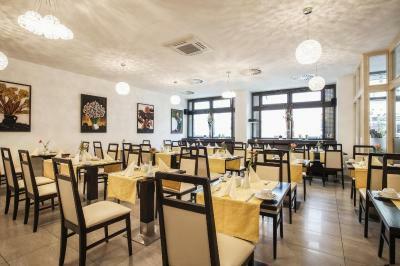 :) So it does not matter which option is chosen by the guest - hotel will prepare that room which they have. 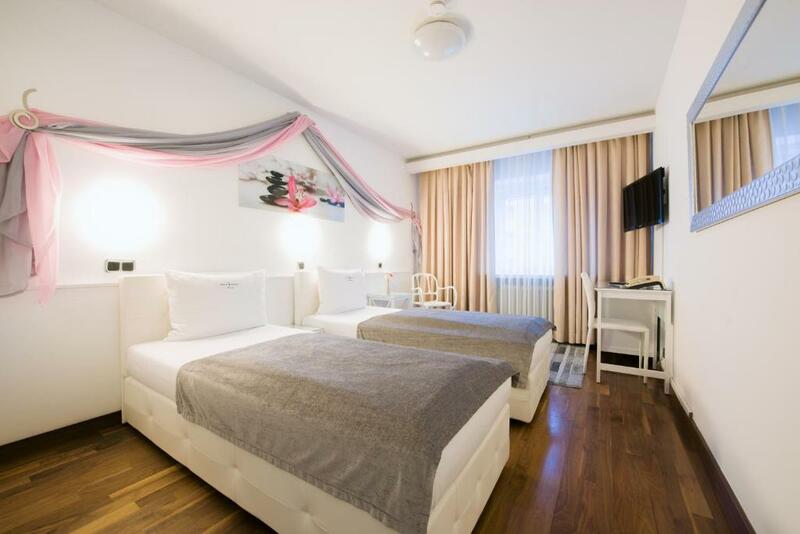 I think it is not e proper way, because if a hotel is not sure that it will be able to meet the requirement of the guest, it should not offer them options - it'd better to write directly and honestly, how many twin rooms do they have and how many double rooms do they have. Fortunately, someone's booking had cancelled next day and hotel changed our room just on the second day. The second issue, winch was really very uncomfortable, was that room key cards used to be disabled almost all time, We had to reload them almost after every use. There was no place to hang jackets in the room. Safe in room doesn't have a locker. 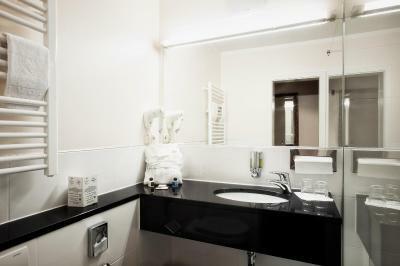 There is only soap in bathroom, no shampoo or anthing else. 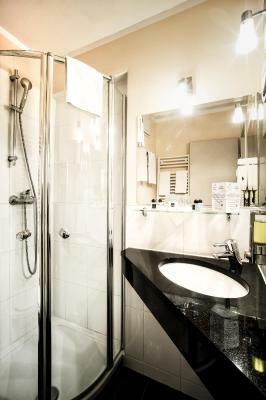 Single room costed 140 EUR per night without breakfst what is way too much for this localization and standard. When I was asking for early check-in and late chack-out I've got reply they are full and it's not possible despite I could see free rooms on booking.com. The area is a bit rough, Parking at hotel only until 12 pm is disappointing. Value for money. Clean room and feel homey. Breakfast is a bit pricey, but pretty standard. No room service, but they are happy for you to order delivery from nearby restaurants or Deliveroo straight to the room. Hotel is right next to both the U-Bahn and S-Bahn, only a short trip back to the Hauptbahnhoff or Marienplatz. Much more convenient and better value than trying to find something within a 10-min walk of the Hauptbahnhoff, less walking with the suitcases from the station (station is completely suitcase-friendly) and is in a much nicer and safer area. Highly recommend compared to similarly priced, lower quality hotels around the HBF or tourist spots. WiFi is really annoying. After every 2-3 days you need to ask for a new password to access WIFI. Location is good. Staff and breakfast is good. The room was not as advertised in the pictures. There was dried blood on one of the bath towels and overall the rooms should be renovated. The location was good as it was next to the S-Bahn. 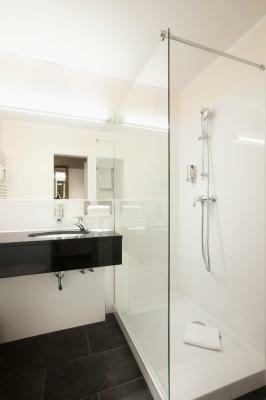 My room was a fairly basic apartment with a newly refurbished bathroom and balcony. This was nice. The wifi was the only downfall, kept disconnecting and/or going very slow! Our room was absolutely lovely! 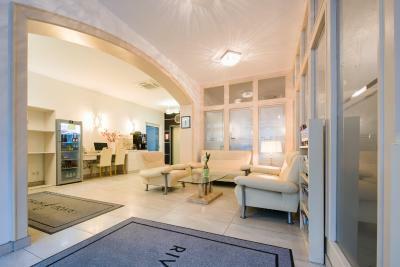 Nice big bedroom with a beautiful bathroom aswell, reception is 24/7 which is amazing! Super comfortable bed and pillows. The staff were all lovely and we were able to store our luggage there on check out day free of charge which was very kind. Train station just down the road which took you anywhere in the city! Not much else in area. No extra amenities for business traveler e. G iron box for emergency. Everything was perfect. Paid too little to stay at such a great hotel.